Florida's First Traffic School has a great way for you to save money on your Florida automobile insurance. By taking the 6-hour mature driver course offered on our website, you could save as much as 15% on your insurance premium. 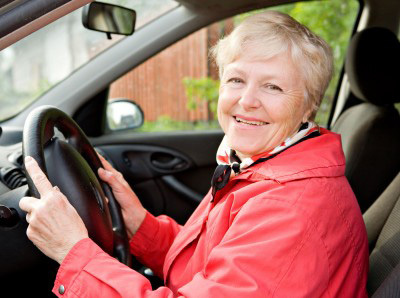 This insurance discount is authorized by Florida law, which rewards senior drivers who have good driving records. Anyone 55 or older who has a clean driving record can take advantage of this benefit. The Florida mature driver discount law can be found in §627.0652, Florida Statutes. You can take this course right here on the Internet by clicking the green register button. "I learned a lot about driving more defensively from this course." The mature driver course was developed by I Drive Safely®, a national defensive driving course provider. This course has met the standards set forth by the Florida Department of Highway Safety and Motor Vehicles for the approval of mature driver courses. Take your mature driver course with a national company that has a reputation for quality. The audio read along feature lets you listen to the course instead of having to read the information on the page. This feature is available as an upgrade for a small fee that can be paid when you register for the course. A lot of people are hesitant to try an online course of any kind because they don't consider themselves to be good with computers. Even though it is less convenient, they would rather drive to a class and listen to someone lecture for hours than try to study a subject on the Internet. Fortunately, over the years the field of online learning has changed dramatically. Online or distance learning courses are now much more user friendly and less likely to confuse the person taking them. In fact, the skills you used to find this web page are the same ones you would use when taking our online course. We consider the Florida mature driver course to be a "no hassle" course. This means that most people will have no trouble with it right out of the gate, but if you do, you can contact customer support, who are there to help you 24 / 7.